For definitions and background see the article in Wikipedia: Lichens are symbiotic organisms made up by the association of microscopic green algae or cyanobacteria and filamentous fungi. 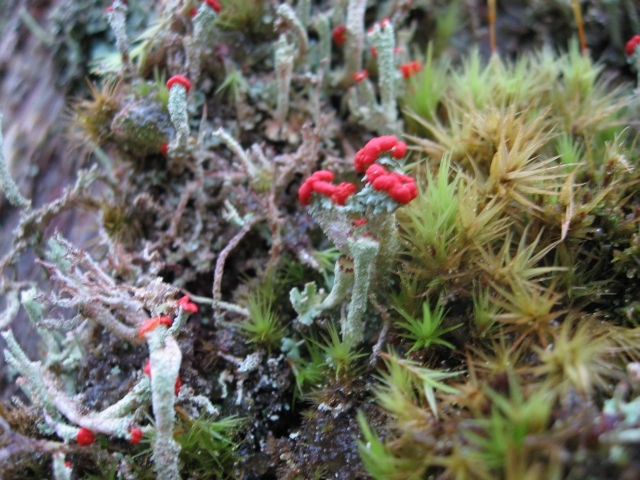 Cladonia floerkeana. On a rotting tree stump, in the wood above Dan-y-graig isaf, Senni. Photographed 04/01/2007. This striking lichen is widespread in the UK on peaty soil, moorlands, heaths, rotting fence posts and rotting wood.